Imagine a dasa system which can broadly indicate the events that can occur in a year in the life of a native? How would it be if we could arrive at the particular year of a Vimshottari Antara for an event to manifest which can then be zeroed in with the aid of transits? The ‘Rasi-tulya-vatsara dasa’ is precisely such a system. This book explains the general rules and special rules of RTVD system discovered by the author and demonstrates its applicability to various branches of human life with the help of more than 150 practical illustrations. The topics covered in the book include: Longevity and Death, Marital Issues, Progeny, Parents, Siblings, Mishaps, Wealth and Finance, Profession, Fame, Awards, and Disgrace. 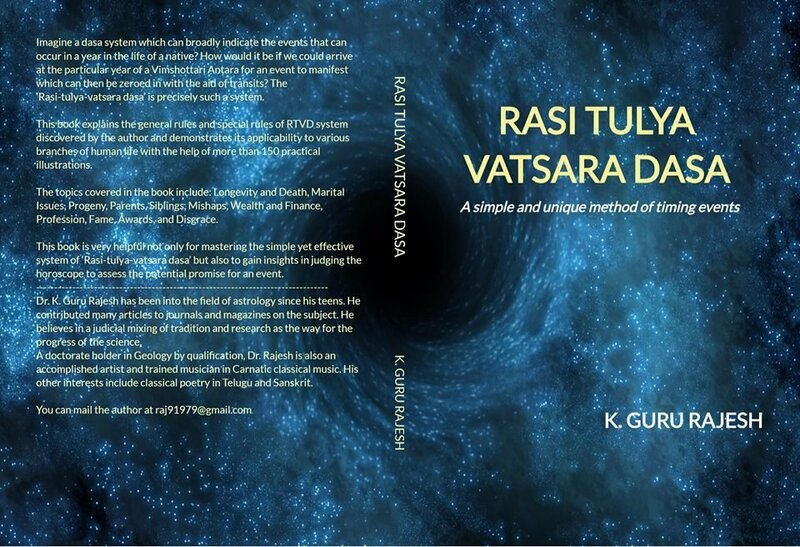 This book is very helpful not only for mastering the simple yet effective system of ‘Rasi-tulya-vatsara dasa’ but also to gain insights in judging the horoscope to assess the potential promise for an event.